Although I'm not a gal for taking selfies myself, I love it when my granddaughters (and occasionally a grandson) sends me their latest selfie. This image was a freebie from LeAnn's World 101 for the coloring contest at their 1st Birthday Celebration all through February. I'm just now getting it done. I colored with ProMarkers, then cut both the image and the scalloped frame with QuicKutz dies. The shapes are cut with dies from Memory Box. The shapes and the scalloped frame were cut from glittered CS. The plaid dp came from a sheet of 12 x 12 scrap booking paper, and now I have remnants of it on my craft table so expect to see it again fairly soon. :-D The sentiment was printed and cut with another QuicKutz die. I'm working on Easter cards because I need quite a few this year, at least a dozen more than last year. Since Easter is only about 6 weeks away, I'm spending most of my somewhat limited crafting time working on them. 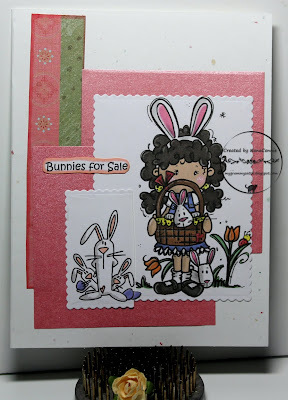 My card today uses a cute images from Bugaboo Stamps. 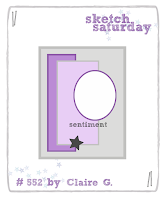 My layout was inspired by the sketch at Sketch Saturday. I used two different images, colored with ProMarkers, the die cut each one with a die from Tonic Studios. I trimmed one side of the smaller one and laid it on top of the larger image. 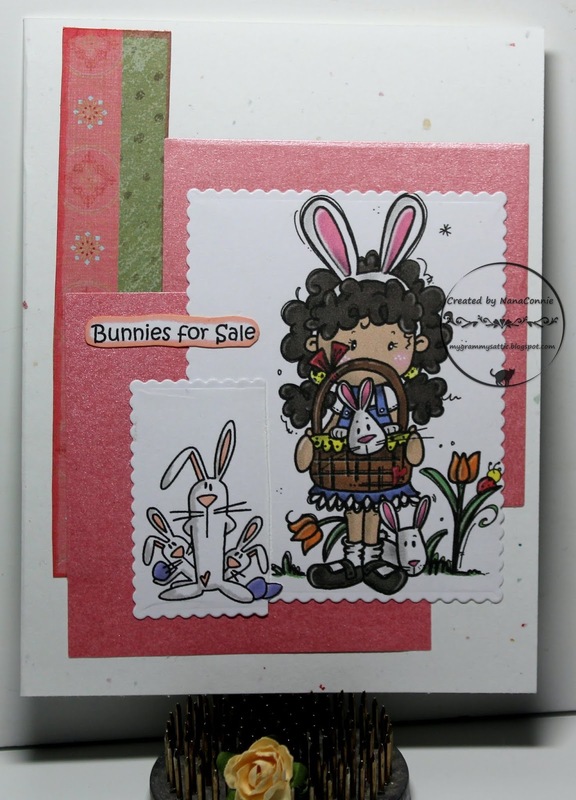 I had two, die cut, scrap, squares of shiny pink lying on the desk and I used them behind the image. The striped dp was also a scrap. I printed, hand cut, and inked the edges of the sentiment, then added it. 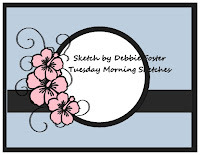 This gorgeous image, with all kinds of options for coloring it, is the freebie image for the Progressive challenge at LeAnn's World 101. I colored them to look like roses which actually grow on a bush in my side yard. I don't know the name of the rose because the bush was there when I moved in but they are a golden, buttery, yellow with pink on the edges. This time, I colored with a combination of ProMarkers and polychromos pencils. I cut the image with a framing die from Spellbinders, then cut a piece of dp with a second die from Spellbinders, which I used as a mat behind the image. The two ribbons are from Really Reasonable Ribbon and I had them in my rather huge stash of ribbons. The bow is another of the ones I sew up by the dozens and I 'dyed' it with ProMarkers. 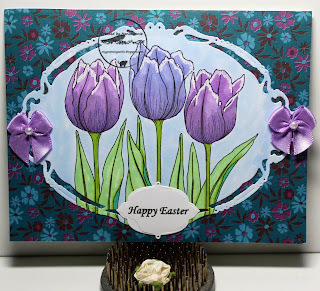 Today I'm sharing my first Easter card of the year and I used a lovely tulip image from Beccy's Place. The House that Stamps Built. 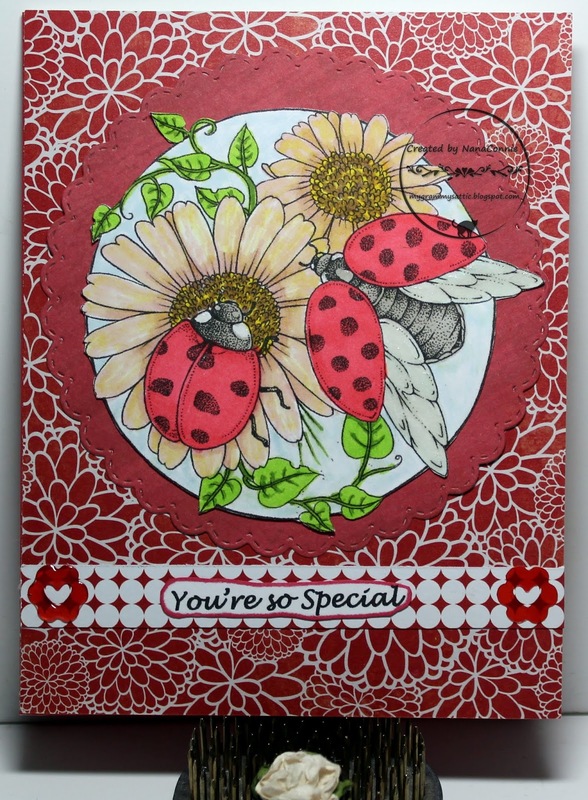 I started by coloring with my ProMarkers, then cut the image with a die from Spellbinders. The sentiment is also cut with another die from that same set. The background dp was a left over on my desk and worked perfectly with the color combo. I find that when I'm using 12 x 12 scrap booking paper, I tend to leave the scraps on my desk after I've cut into a new sheet. Over the next few days of crafting, I'll grab and use up those scraps as they work with whatever I'm creating at the moment. Often, the scraps themselves will inspire the next color combo. I added two of my signature, hand-tied, bows with pearls. 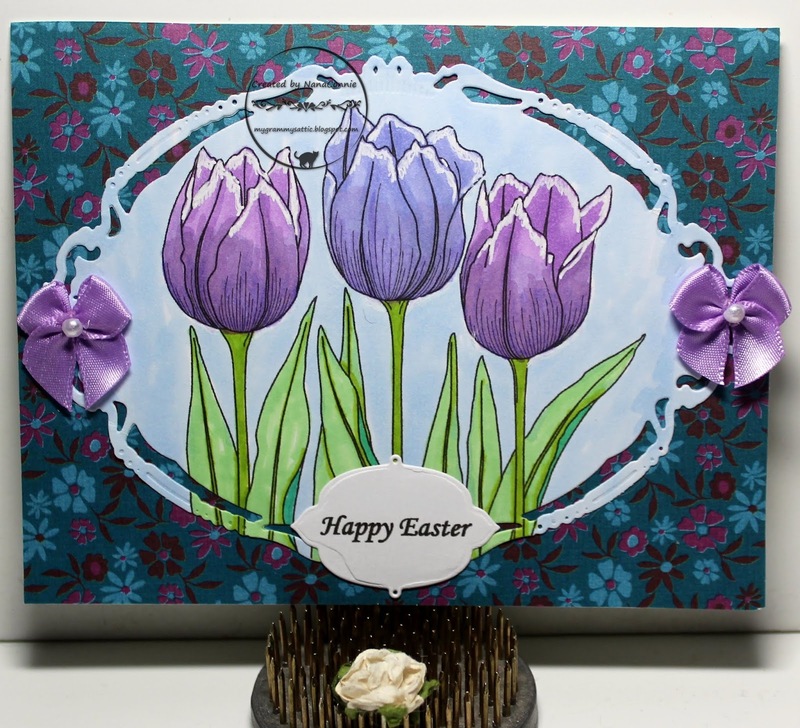 I used a ProMarker to 'dye' them the color I wanted, choosing the lilac color of two of the tulips. Welcome to another Friday and the start of another challenge week at QKR Stampede. Our theme is always "Anything Goes" and you can use products or images from any company. If you do choose to use a QKR Stampede image (or even one from our sister company, Eureka Stamps), your entry will go onto a separate draw and that increases your chances of winning by a huge margin! 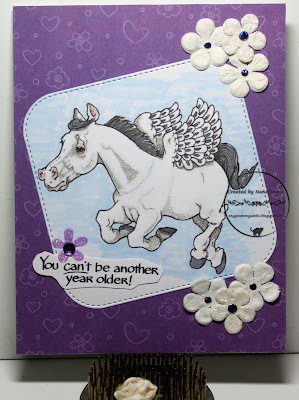 This QKR image is called "Pegasus" and I love him to bits! but I reversed it and adjusted it for a vertical card. 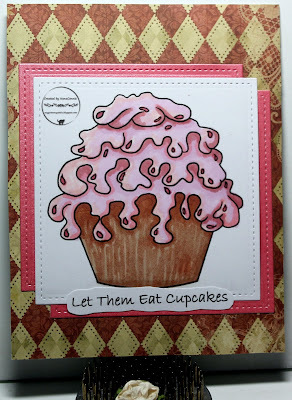 I used ProMarkers to color the image and cut it with a stitched die from Card Deco. 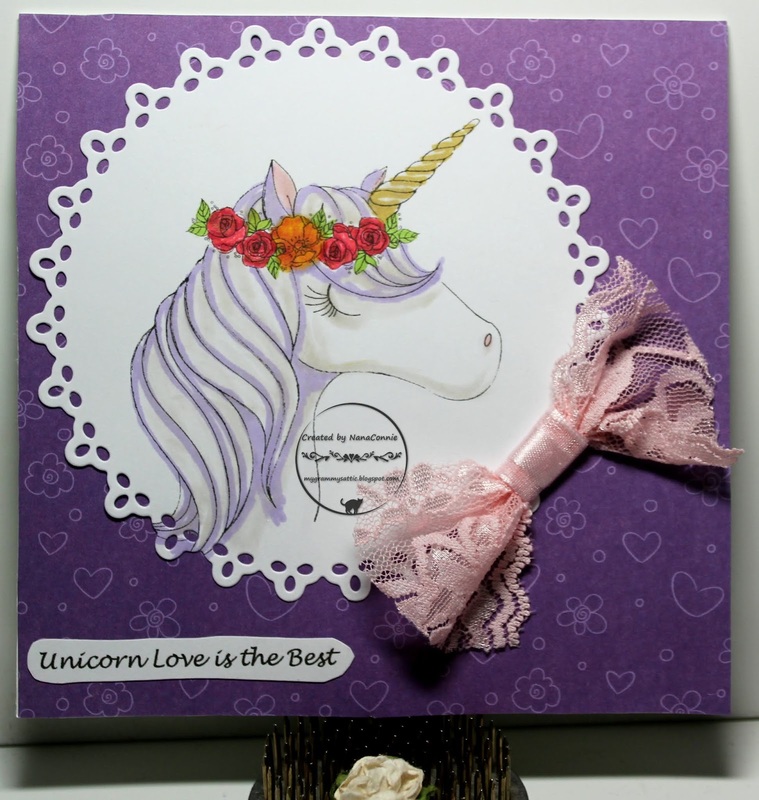 I used my favorite purple paper with hearts and flowers on it as the background and added the sentiment to it. I die cut all the flowers (Spellbinders), added glitter to two of them and to the lavender flower, then added tiny gems. I added Glossy Accents to his eyes and wings but none of that shows up very well in the photo. 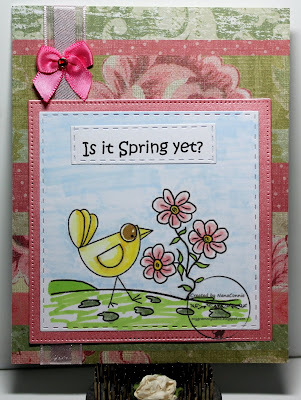 This image from the Progressive Challenge at Limited Runs is so perfect for spring (which hasn't arrived at my house yet - how about yours?) Each day with a freezing temperature makes me wish more strongly for spring. 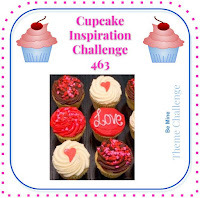 Before I had decided what to do for the background, I saw that the Color challenge at The Outlawz gave us one color (green), an option to choose two other colors from the inspiration photo (see below) - I chose pink and pale blue - and the twist was to make our own background. I sorted through the dp scraps on my desk, added a strip of washi tape, and laid them all together on the card front to make the background. Fortunately, all the dp scraps were distressed and worked well together. I colored the image with ProMarkers and cut it with a stitched Unbranded die. 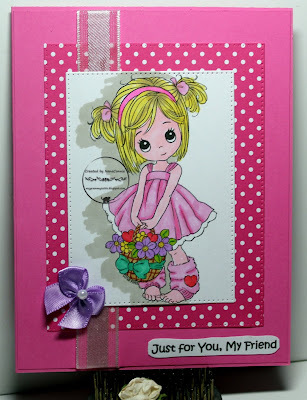 The glossy, pink frame was cut with a Cottage Cutz pinpoint die. I thought they complemented each other. The pale pink satin ribbon was a left over scrap and the deep pink ribbon for the bow was in my stash. I added a tiny gemstone to it. I did my usual coloring with ProMarkers, then cut the image with a die from QuicKutz. The background paper is the last scrap of a 12x12 scrapbooking paper from my stash. I'm sad to see it used up and will have to look for more. I love that it has hearts and flowers and is PURPLE!!! I knew I wanted a really different kind of bow for this one so I used a scrap bit of lace, rolled and pinched it in the middle, then wrapped with satin ribbon. The sentiment was printed and hand cut, then added to the bottom. Not quite CAS but not overdone either. We've had lots of rain this winter and we're grateful for every drop of it having been in or on the verge of a drought the last two years. I haven't seen any ladybugs in my garden yet - I think it's still too cold for them to be out and about but I'm ready for a touch of spring anyway. :-D And no matter what the season, it's always time for Someone Special! The image came from Ching-Chou Kuik and I colored it with my ProMarkers. Although it's very difficult to see in the photo, I added Glossy Accents to the underwings and the white spots on the ladybugs. The image is cut with a circle die from Spellbinders, leaving the leaves, flower petals, and wings out-of-the-box. 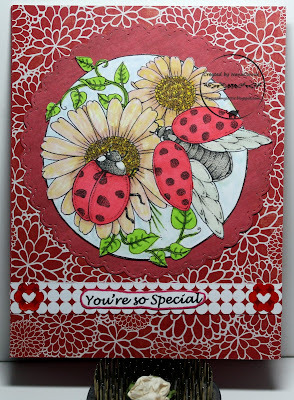 The red circle frame is cut out of a scrap of dp using a stitched, scalloped die from Memory Box. The background dp and the strip holding the sentiment are opposite sides of dp from a Paper House stack. I added tiny, epoxy, flowers that have a heart in the middle to each end of the sentiment piece. This darling little girl with her flower basket is from Conie Fong and she was such fun to color! I love the tiny hearts in her basket and on her socks. 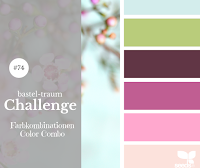 I was inspired by the color palette at Bastel-Traum. I colored with ProMarkers, then cut the image with a pinpoint die from Memory Box. The polka dot frame was cut with another pinpoint die from that same set. I added a scrap of satin ribbon between the frame and the image and wrapped it around the card front. I decided on a sentiment which would be more versatile than a "Valentine" greeting but which would still work for that if desired. I printed and hand cut it before adding it below the image. My final touch was the hand-sewn bow with pearl. Welcome to yet another Friday and the start of another "Anything Goes" challenge at QKR Stampede. 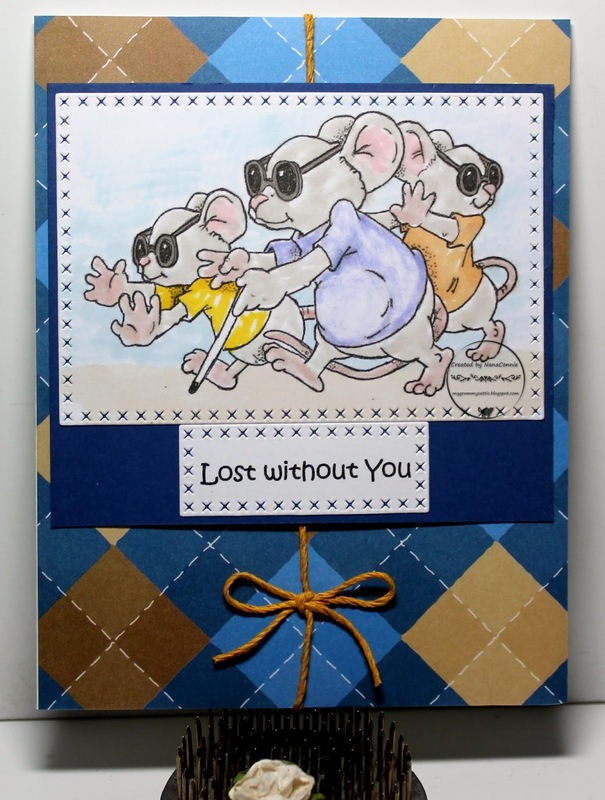 I've been playing with some of the older images in my QKR collection and this one, called "Blind Mice," was perfect for a card that seems to say "I'm really missing you!" 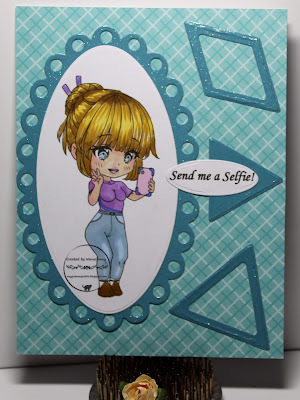 I made this card before I found my markers so this is colored with a combination of water color paints and colored pencils. I cut the image and the sentiment with Unbranded, cross-stitch dies, then mounted both pieces onto a scrap of dark blue CS. I found a scrap of jute cord in a color perfect for this card and added it before layering on the image. I wanted this to be a masculine card so I didn't embellish it any further. Happy St. Valentine's Day ! I want to share with you my last three vintage Valentines. These were done at the last minute after I got a call yesterday from a friend who had seen the earlier ones I did and asked if there was still time for me to make two cards for her grand-daughters (ages 4 and 6) and one for her daughter. On both cards, the kittens were originally gray scale images so I used ProMarkers to add some color. On the top one, I used white gel pen to add the sentiment to the hearts. I fussy cut the kittens and added them to a red heart with Pop Dots, then layered that onto a white doily. I used 'confetti' CS to make the card base, added two scraps of red dp (Paper House) and one of my signature, hand-sewn, bows with a pearl. 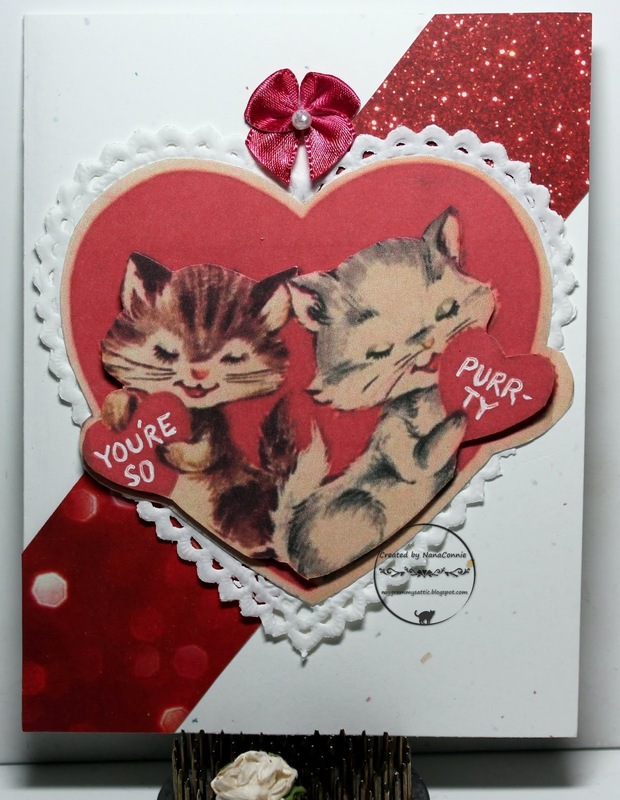 For this second card, the kittens were already in a heart shape so I fussy cut that allowing for the pink bow and the rose to be "out-of-the-box." I used dimensional tape to add the kitten/heart piece to the inside of a filigree heart stamp. 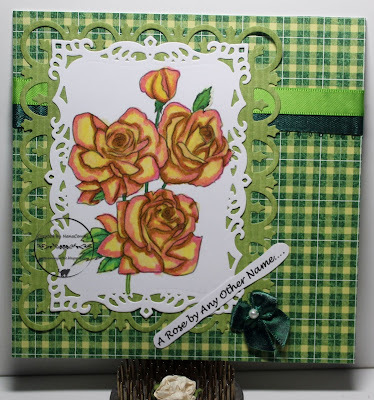 I cut that piece with a Gina Marie die and added the sentiment to the top and bottom. 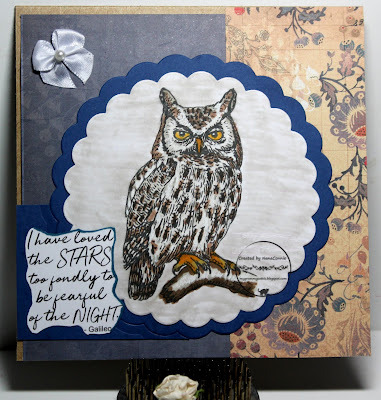 I used chalks to 'sponge' the border. 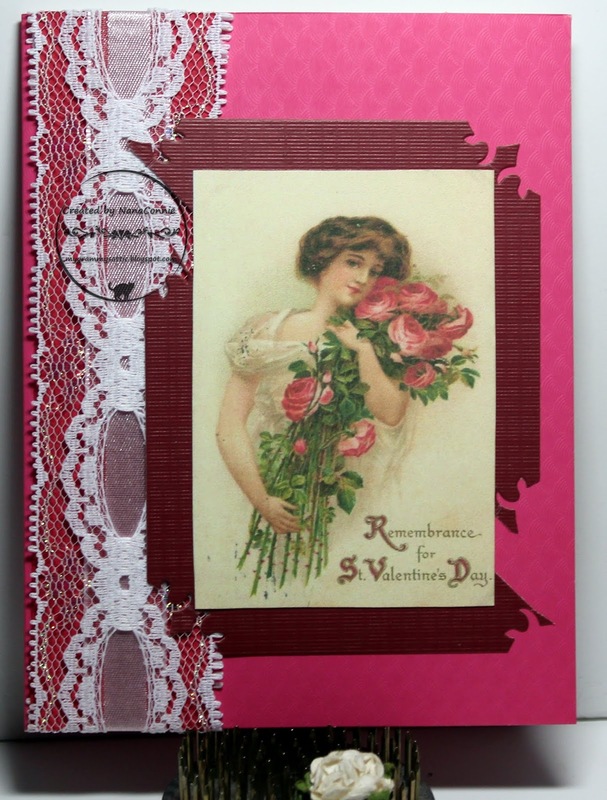 The card base is embossed, burgundy CS and I added a scrap of dp from my stash plus 2 blue doilies. Finally, this is the card for her daughter. 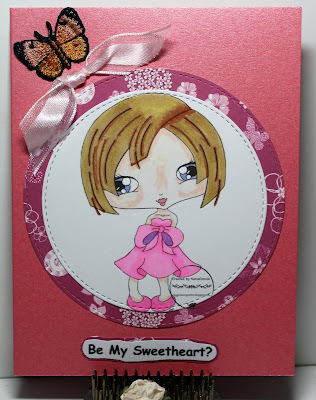 On this one, I highlighted the roses with white gel pen on one of the images and popped up the roses and the bow in her hair with Pop Dots for added dimension. The lace behind the image is from my stash and the pink half-frame is a scrap of CS which was on the craft desk. The bright pink bow was made with lace, wrapped with satin ribbon. I added the tiny, epoxy, flower/heart and called it finished. and used 3 of the options: Kobe, Kobi, & Knot It. I colored with ProMarkers, and cut both the mage and the frame with double stitched circle dies from Die-namics. The flowery dp used for the frame is from 7 Gypsies. The butterfly is machine embroidered on my machine and the ribbon is a scrap bit which I tied into a knot. Quick post today because I'm running late for an appointment. I'll add all the challenge links when I return. One more progressive challenge in the bag and I love this sweet image of a big, happy family. What better way to say "Love" this month? The image is from Sasayaki Glitter and I think it's one of their best. I used ProMarkers to color the image, then cut it with a die from Gina Marie. The purple dp was a scrap left over from a DT project which you'll see in a couple of weeks. The dark blue CS was also a scrap and all of those things were layered together onto a 'confetti ' CS base. I printed and hand cut the sentiment, then inked the edges before adding it to the bottom of the card. I used one of my signature bows, left white this time instead of 'dying' it to match a color in the card, and I added a sparkly gem to it. and the images are also from Beccy. I used colors from the challenge at C.R.A.F.T. with the red and pink being in the dp "flags." 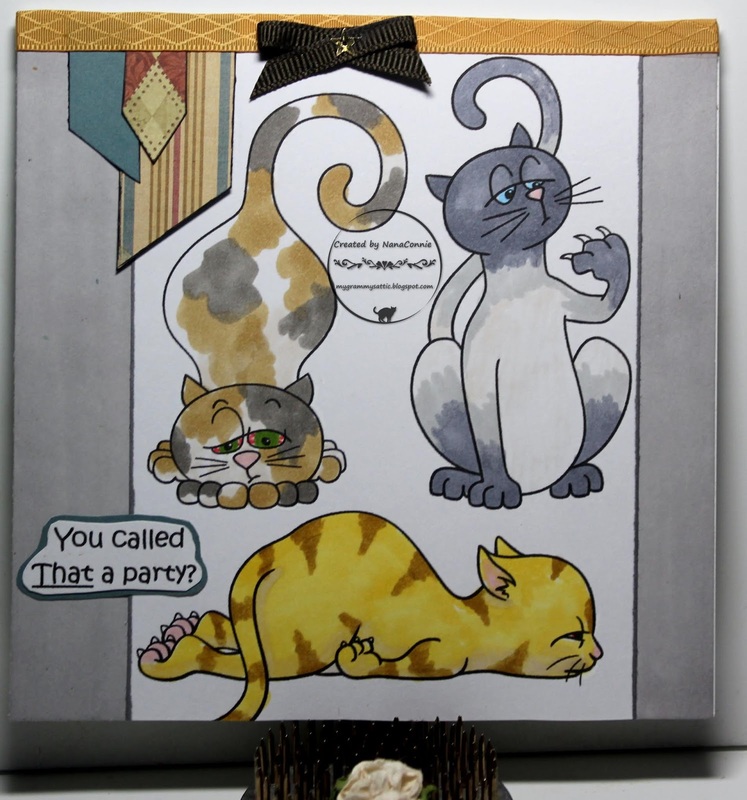 I started by merging the three cat images, then colored them with my ProMarkers. The gray background is washed with a muddle of watercolor paints and the image piece laid on top of it. I printed and hand-cut the sentiment, then matted it and hand cut that. The 'flag' strips were all cut from a single, two-sided scrap of 7 Gypsies paper which had been slipped back into the stack. Instead of throwing it away, I cut and used the little flags from it. The diamond texture ribbon is from my (huge) stash of Really Reasonable Ribbon bits. The dark brown, grosgrain, bow was hand made and I added a tiny sequin star to it. Hey, guess who found her ProMarkers? One more craft room box unpacked and put into the new space. :-D Having organized them, it was necessary to immediately use them. You understand, I had to test them to see if any had gone dry or leaked or changed color. Besides, the progressive challenge at Limited Runs comes to an end in just a few more days and I had to get something made and submitted. 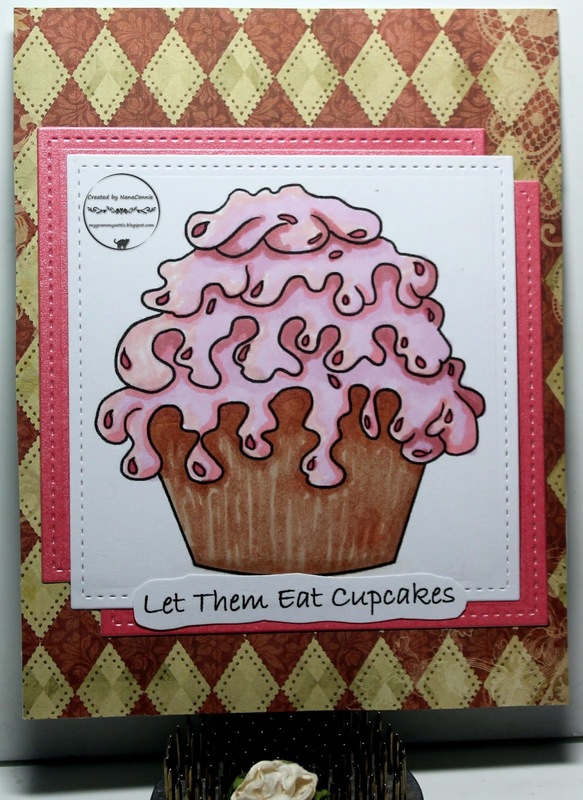 I colored the cupcake with ProMarkers, then used a stitched die from Lawn Fawn to cut the image and the two framing pieces. The dp is from 7 Gypsies and each little diamond in the pattern echos the stitching. I decided on a CAS design, letting the pattern in the dp do all the visual work. I have to get this post written up very quickly before the feline fur babies awake and see me posting something featuring a puppy! Here are two more of the Valentine cards I've done by recycling vintage Valentines from the box I found hidden under who know how many tons of supplies when the craft room was getting packed up and reorganized. I especially love these two and put in quite a bit of work on them. Let's start with the puppy. Starting from the card base and working upward, the background dp came from Paper House, trimmed to fit the front of an A2 size card. I had some lovely, glittered ribbon scraps in my stash which I think came from Crafty Ribbons. I dug out a set of doily dies from Spellbinders, and cut alternating layers of white and pink doilies (all cut from scraps), offsetting them as best I could. Once all those were layered together with foam tape, I added the hand cut puppy to the top of the stack. 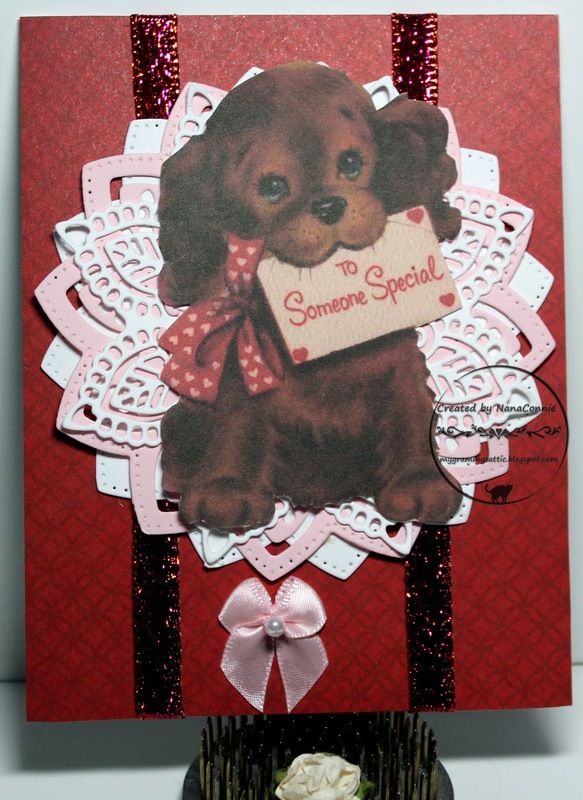 I added one of my signature bows to the bottom of the card front and called it finished. 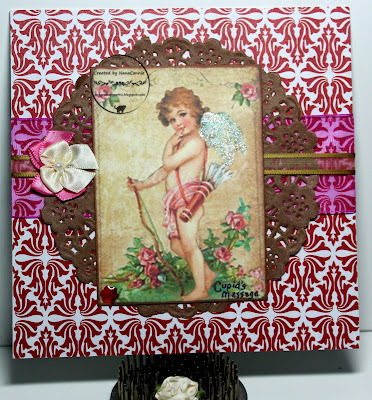 Here's the second card with a sweet cupid image. The image went on top and I make a double bow but sewing two hand crafted bows together. The final touch was a tiny, epoxy flower in the bottom corner of the image. I hand wrote the sentiment in the opposite corner. 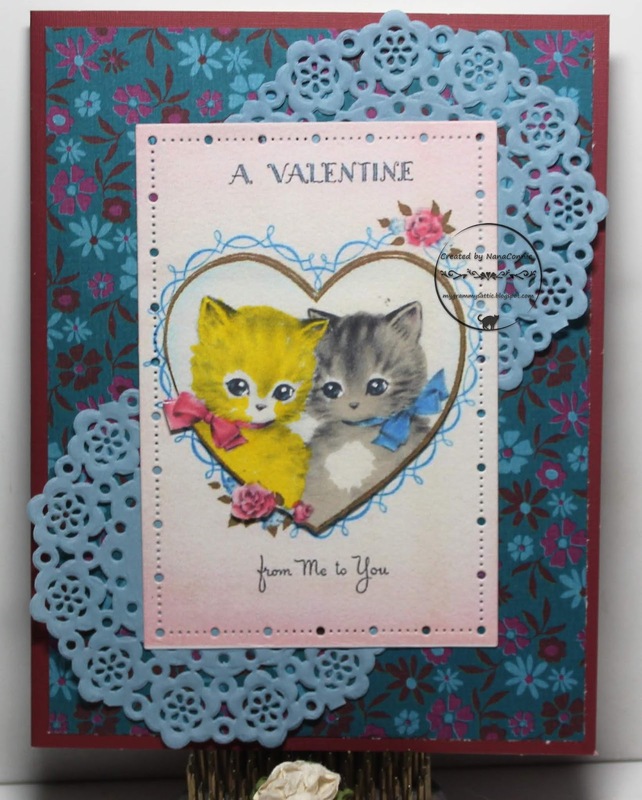 This time, I fussy cut the kittens and added them to a heart shaped doily with dimensional tape. I found two scraps of red dp from a stack by Paper House, and used those to cover the front of a square card base. The doily went on top of that and I added a red, epoxy flower with a heart in the middle. The bow is one of my signature, hand-sewn bows with a pearl. The second card has a fantastic image of a Victorian lady with roses. I cut the image from the original card with a QuicKutz rectangle die. The "frame" behind it was a negative left over from cutting out a frame with a die from Spellbinders. I took that piece, cut it diagonally, and offset the pieces behind the image. That piece was previously embossed but I don't remember which of my embossing folders was used. 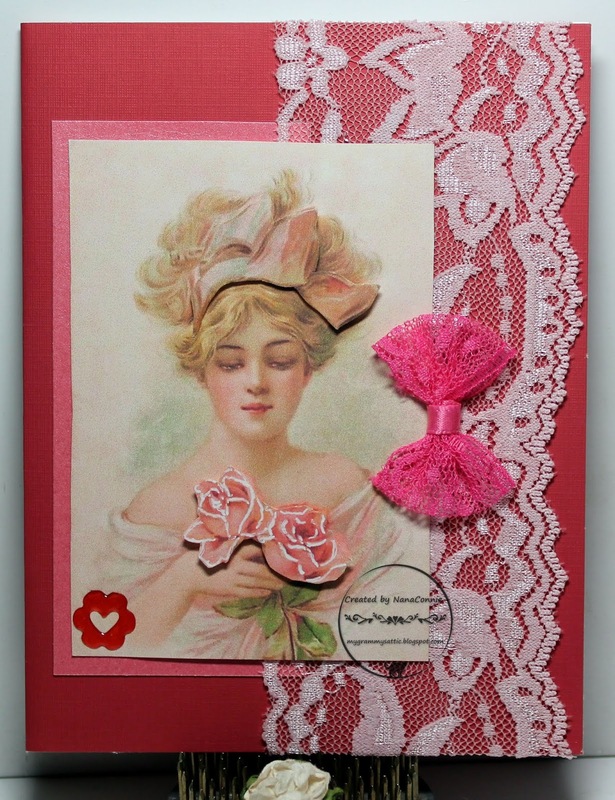 The deep, pink card front is dry embossed and I used a scrap of white lace threaded with a piece of pink, satin ribbon and layered those along the left side of the card front. 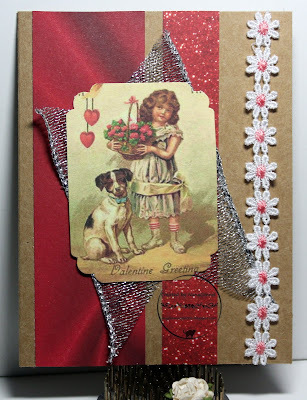 I've done a few Valentine cards using recycled and vintage images since things are still not completely accessible after all the boxing up and reorganizing. Most of the markers and colored pencils are still put away and my printer use is somewhat limited. But I am loving the entire box of vintage Valentines which were given to me several years ago and which got set aside during the last move. I found them a few weeks ago and they have been put to great use during this year's turmoil. Expect to see several vintage Valentine cards over the next couple of weeks. I thought this image was adorable with the little girl and her faithful dog. I cut the old card, used a Spellbinders die to cut the image into a rectangle, then punched it with a Fiskars' corner punch. I used scraps of red paper on a kraft card base, and layered on a scrap piece of wide, wired, sparkly, silver ribbon before adding the image piece. 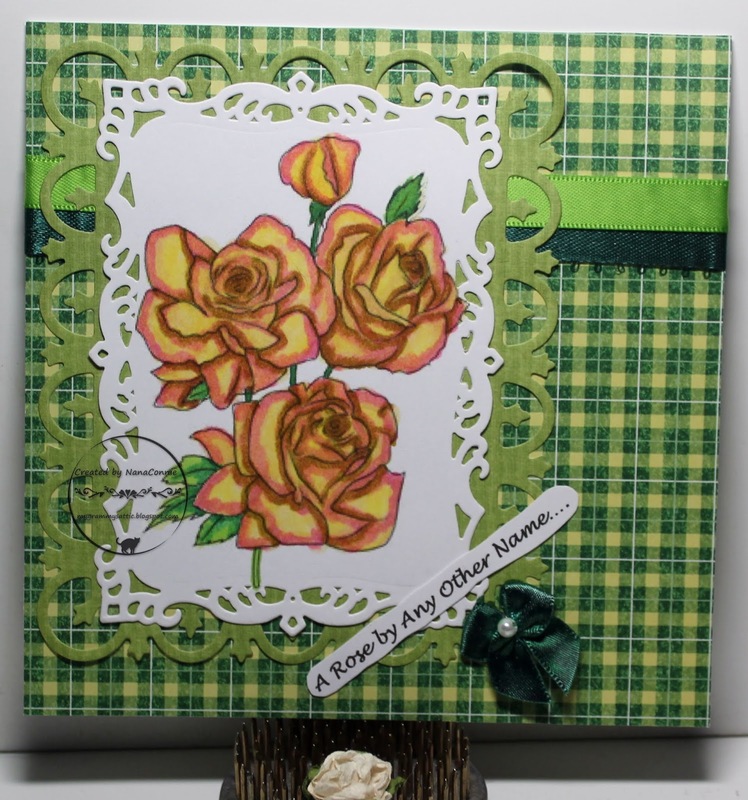 That ribbon and the flowers gave the card some really great texture! The ribbon of embroidered daisy flowers with pink centers came from my stash. The image I used today is from QKR and it's called "Bandaged Cat." Every time I use this image, I can hear my dad in my head talking about someone being "as nervous as a long-tailed cat in a room full of rocking chairs!" lol Now you know why! I used my ProMarkers to color the cat, then cut the image with a die from Lawn Fawn. I cut the blue frame with a Cottage Cutz die. 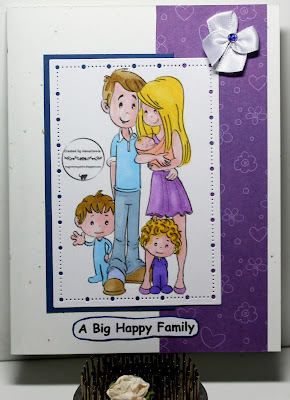 The shiny, metallic background was cut with an Altenew die and everything is layered onto a smoke-blue card base. I printed and hand cut the sentiment, matted it with a scrap of blue CS, and added that below the image. 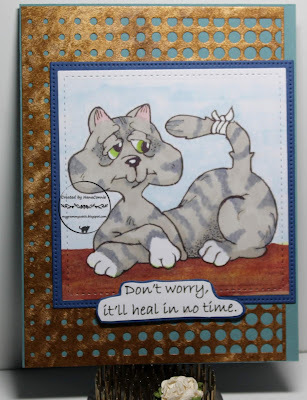 Because I used this as a masculine, get-well card, I didn't add any further embellishment. I thought the texture of the layers and the die cuts was enough. 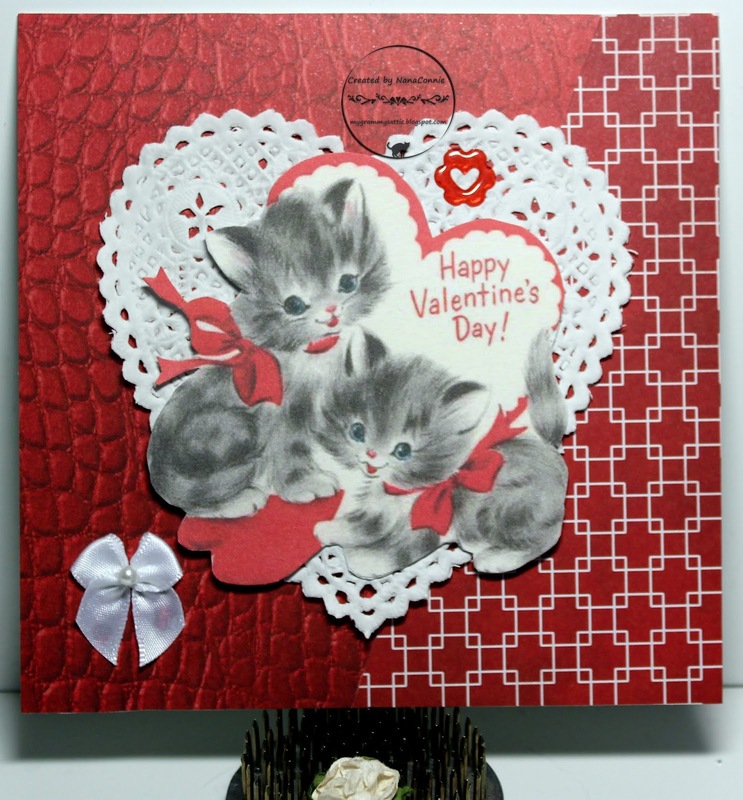 It's time for our February challenge at 2 Crafty Critter Crazies! As usual, our theme is "Anything Goes with a Critter" and, once again, Sparkle n Sprinkle is our fabulous sponsor. They generously provided images for our team members to use and I hope you're going to visit the main 2 Crafty Critter Crazies blog to see all of the inspiration the team is offering. I used an incredible Owl set (Great Horned Owl) designed by our very own Donna E! Isn't it gorgeous? I colored the owl with ProMarkers and then used SnS EP to heat emboss the white areas on the owl's feathers and on the tree branch. 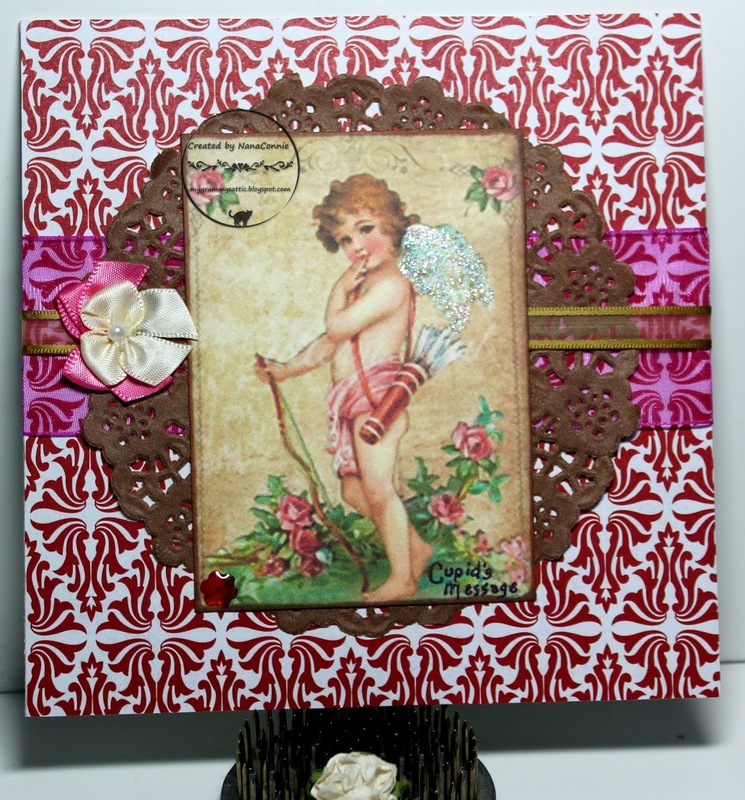 I cut the image and the frame with scalloped dies from Sizzix. The deep blue dp is from 7 Gypsies and the flowery paper is a scrap of origami paper. I printed and hand cut the sentiment (also part of the Great Horned Owl image set), inking the edges of it. The CS behind the sentiment was a scrap left from die cutting the blue CS frame. I simply lined up the scallop spaces and that helped to pop the sentiment off the background. The card base is kraft CS. I added one, hand-sewn, bow with a pearl for embellishment and decided it was beautifully finished. I know I'm going to be using this set a lot. There are so many options available. Go check it out.